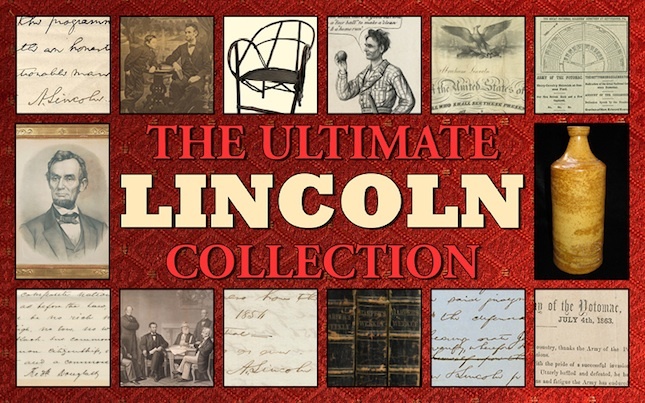 We are offering a unique opportunity for one high-level collector with a passion for history—a comprehensive collection reflecting the span of Lincoln’s adult life from prairie lawyer, to the Presidency, to immortality in the American pantheon. This ready-to-display collection is being auctioned on eBay through February 18th, and is guaranteed to be delivered in time for the ultimate Oscar party. Beginning with the chair in which Lincoln was sitting when he received the telegram that he had won the 1860 Republican Presidential nomination, the collection contains more than 50 items, including 12 documents handwritten and/or signed by Lincoln, and others by Frederick Douglass, William T. Sherman, and Ulysses S. Grant, along with rare books, artifacts, images, and imprints. Highlights and a brief summary of the collection are available on eBay and links to more detailed descriptions are on our website. On Lincoln’s birthday, February 12, we will be hosting an open house at C. Parker Gallery, 17 E. Putnam Ave., Greenwich CT. Special showings are also available on request. Call me at 914-289-1776 or email me at info@sethkaller.com. Last year, I joined the advisory board of the Papers of Abraham Lincoln, based at the Abraham Lincoln Presidential Library and Museum in Springfield, IL. My first meeting coincided with the 10th annual Lincoln Legacy Lecture, where I saw a powerful keynote presentation on modern day slavery. Since then, I sought an opportunity to apply my interest in history to a significant problem that remains today. After several conversations, Free the Slaves was recommended to me as a fitting choice to further Lincoln’s most important legacy.